Loaded with peanut butter sandwiches, power bars, Gatorade, grit and prayer, nine U.S. seminarians studying in Rome ran relay-style across the Italian peninsula to raise funds for displaced families in Iraq. Warm-up included a pre-dawn Mass 6 May at the Pontifical North American College where the students live, followed by packing two vans with nine runners, two drivers and protein- and carb-rich provisions, Christian Huebner of the Archdiocese of Washington, D.C., told Catholic News Service on 4 May. One van headed to the Mediterranean Sea near Fiumicino and the other van went east to the Adriatic Sea. “When we arrive, we dip a finger in the water and run to the middle” of the peninsula, which is about 240 miles across, he said. The students meet up in the middle by evening “in some random parking lot” as long as it had a gas station and pizzeria to replenish tanks and tummies. He said the men take turns running one leg of five to nine miles to a planned checkpoint and then the finishing runner would “slap hands” to hand-off the virtual baton to the next runner in the relay. The men stretched and rested in the moving van, encouraging the one on the road along the way, he said. The one-day run raised more than $15,000 dollars, in part thanks to an anonymous donor who matched every dollar pledged. The money goes to the pontifical foundation, Aid to the Church in Need, which will use the funding to continue a program that feeds some of the 12,000 displaced families from Mosul living in Erbil. The Chaldean Catholic Archeparchy of Erbil, in conjunction with other aid agencies, is the largest provider of aid to the displaced families in that area, the seminarians said on their “Roman Run for Erbil” donor page. 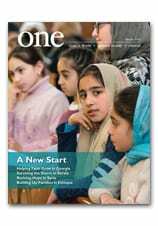 The Chaldean Church organizes pastoral programs, runs seven schools that are open to displaced children and provides food aid, said the donor page on the www.ChurchInNeed.org site. This was the third year a group of U.S. seminarians — led by Deacon Michael Zimmerman of the Archdiocese of Boston — got together to do a fundraising run for a common cause. Past efforts raised money for a seminary in Haiti, a pro-life center in the United Kingdom and the Syriac Catholic Church, Huebner said. Unfortunately, he said, Deacon Zimmerman, the run’s founder, had to miss this year’s run because of a soccer injury. The biggest and most important aim of the relay run, Huebner said, was supplying prayer for and solidarity with those who are suffering. “One thing the Holy Father says,” is the importance of “taking prayer with you along the way” every day, and the “Roman Run” does that, he said, with prayer being a part of the training, fundraising and race. In this image from 2016, Melkite Greek Catholic Patriarch Gregory III meets with children as they take part in a day of activities and prayers at a church in Damascus. Russian President Putin’s special envoy to Syria Alexander Lavrentiev, Kazakh Foreign Minister Kairat Abdrakhmanov, UN Special Envoy for Syria Staffan de Mistura and Iranian deputy foreign minister Hossein Jaberi Ansari attend a signing of a memorandum to establish de-escalation zones in Syria during peace talks in Astana, Kazakhstan on 4 May 2017.